By the time you receive this, Nome may be experiencing our first frost of the winter. The average first day for a below-freezing temperature is August 19th. Brr! As we batten down for the Arctic winter, we thank you most sincerely for your prayers and your continuing financial help for our mission. Times are lean, and we need your support now, more than ever. God bless you for your kindness! BRAND NEW (left) Meet Kristina Proctor, KNOM’s newest volunteer. From San Antonio, Texas, Kristina is a 2007 graduate of Lenoir-Rhyne College with a degree in electronic and corporate communications. While in school, she spent most spare hours at the college radio station. With the title of production director, Kristina organizes and records KNOM’s educational spots, and has announcing duties, too. 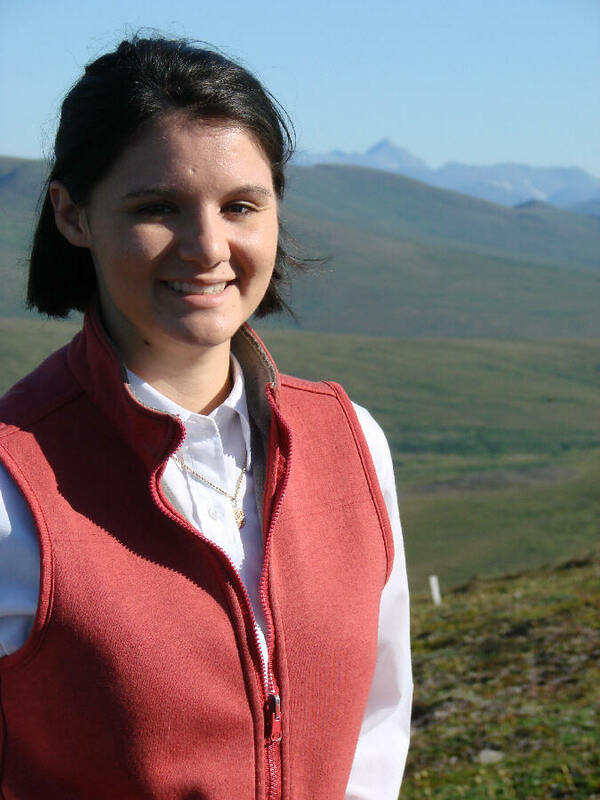 She’s standing atop Nome’s Anvil Mountain, with the Kigluaik (KIGG-loo-ik) Mountains in the background. General manager Ric Schmidt continued the 25-year series “Today in History,” highlighting past events. 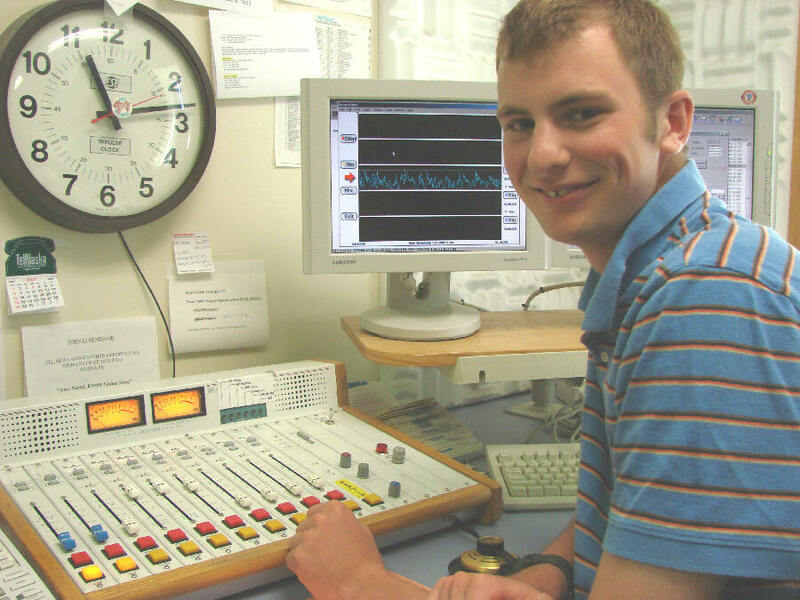 These short mini-programs fit neatly among music and news and have been a backbone of KNOM's educational component since we signed on the air thirty-six years ago. They attract attention and make their important points before a listener has time to be distracted. Thank you for making them possible. KNOM is the oldest Catholic radio station in the United States, beaming to 100,000 square miles, thanks to you. INSPIRATIONAL SPOT: In my best moments, I don’t want to waste my time trying to be better than the people around me. I’m grateful for the talents and goodness of others, and that makes it easier to be thankful for my own. “It’s one of the poorest parts of South Africa,” Jesse says. Please join us in praying for this fine young man and the new group of God’s children whom he will serve. HALOS: Our hats are off to volunteer inspiration director Dave Dodman, who is writing a new series of inspirational spots on the lives of the saints. They’re voiced by Betsy Brennan. July’s saints spanned a millennium, including St. Padre Pio, the devout Italian Capuchin priest who was ordained in 1902, and St. Vladimir of Kiev, a brutal Russian ruler in the late 900’s who converted to Christianity and reformed his ways. It promises to be a fascinating series. TAKING THE HEAT: In mid-July, it was very un-Nome-like, with six days of temperatures warmer than +70�, some running twenty degrees above normal. Staff at the National Weather Service reminded KNOMers of summers when the mercury rarely rose above +45. INSPIRATIONAL SPOT: Lord God, My Creator, help me to create, too. Create peace by my forgiveness. Create understanding by my being open-minded. Create hope by my gentle caring. Create love by my generously serving others. INSPIRATIONAL SPOT: For the sparkle in the eyes of loved ones, for the touch of a friendly hand, for the bread we eat, for the plentiful stars, for the roar of the ocean breakers, for the Holy Word You have spoken to us, for the chance to be and to do, we thank You, O Lord Our God. HEAVE-HO! (left) In July, Tom Busch removes each of our transmitter’s twelve heavy power modules, checks them and carefully tightens all bolted connections (about 800 of them), which tend to loosen due to vibration caused by ventilating fans. It’s an annual ritual. This year, he found about fifty connections that accepted tightening, and $140 worth of capacitors which need to be replaced before they fail. Thanks to modular construction, the station remains on the air at full power during this maintenance. KNOM’s founding volunteer chief engineer in 1970, and the mission’s general manager from 1975 to 2005, Tom is now in charge of all non-programming and non-staffing aspects of KNOM. He and his wife Florence now live in Anchorage, but he’s in Nome once a month and does manage to get a few calluses on his hands now and then. TEN YEARS AND 87,550 HOURS LATER: We commissioned this transmitter in the early morning of August 16, 1997. Since then, it’s been off the air a few times, mostly for tower maintenance. It has never failed, and has faithfully beamed KNOM’s inspirational and educational signal for about 87,550 hours. If you were part of the effort that made replacing our $300 construction shack with a safe, modern, efficient building for this transmitter, we thank you many times over. 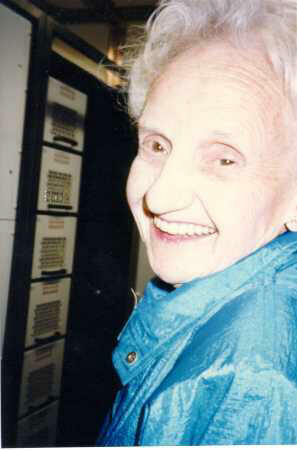 “Aunt Bill,” as she was known to family and friends, contributed $50,000 to the project, which covered about one-third. Long-timers will remember seeing pictures of Antoinette cutting the inaugural ribbon. We remember her fondly and prayerfully. 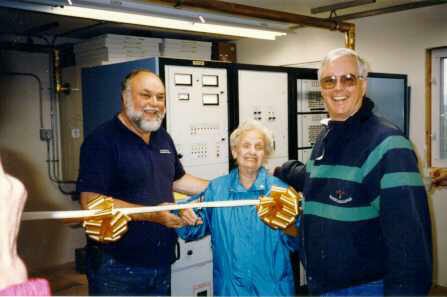 (Left): Accompanied by, at left, engineer Les Brown, and at right, general manager Tom Busch, Antoinette cuts the ribbon at a brief but joyous ceremony August 16, 1997.
among others. Thank you for making these discussions of important issues possible. Please consider adding the KNOM mission to your will. We prayerfully place all such gifts into funds that help protect the mission against future emergencies, and provide for major improvements. INSPIRATIONAL SPOT: Let us greet each morning as if it were our first. Let us bid farewell to each evening as if it were the last. Let us live always with the acknowledgement that each day is precious. INSPIRATIONAL SPOT: Can you imagine what would happen if I were to spend the same amount of time, energy and interest on my soul as I do for my body? One lasts a few years, the other forever. If someone made a study of my life and saw how much attention I give to each, which one would they think I consider immortal? INSPIRATIONAL SPOT: Time on your knees will put you in good standing. 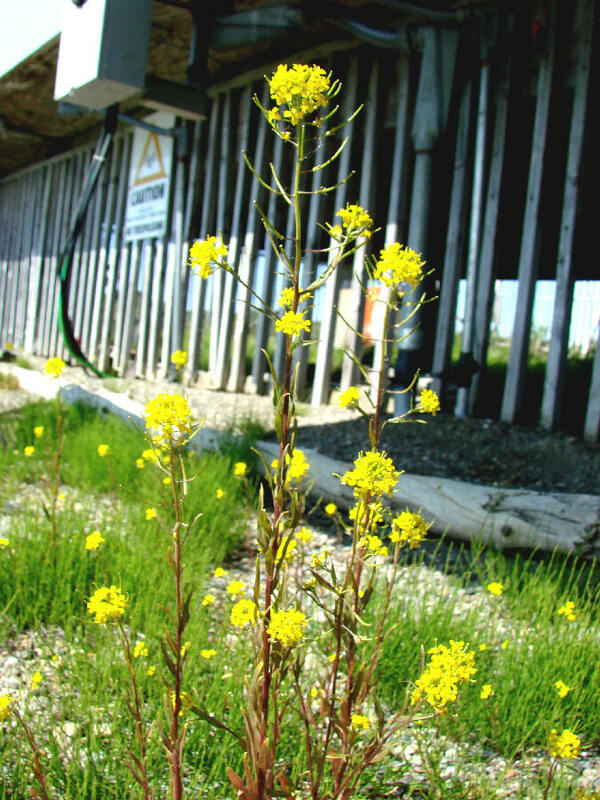 HARDY: (left) Tundra flowers rise from the gravel near the KNOM transmitter building in mid-July, at the mouth of the Nome River, three miles east of Nome. In summer, the tundra is filled with tiny plants and flowers. As rugged as they are, many have delicate appearances. By the time you read this, the tundra will be preparing for winter. Look for more flower pictures in this edition of the Nome Static, as well as July’s. Bonus: (left) A lone salmonberry begins to ripen at the KNOM transmitter site. 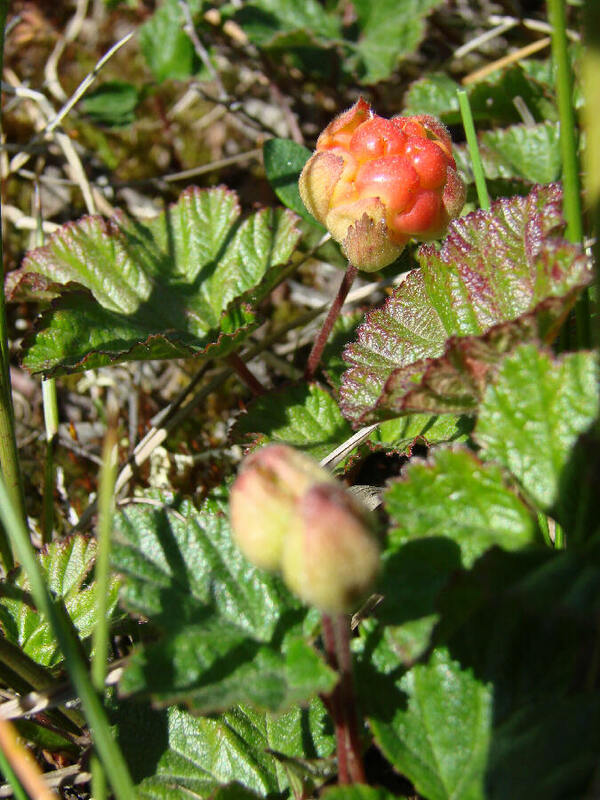 Wild salmonberries, which tend to grow in boggy, marshy areas of coastal Alaska, as well as the Pacific Northwest, are an important source of nutrition to western Alaska villagers. 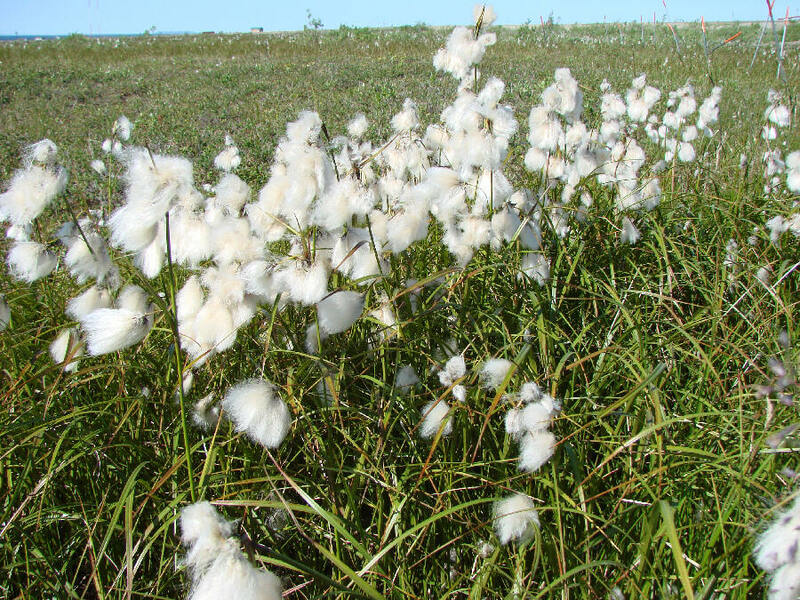 (Left) Alaska cotton, another boggy plant, thrives at the KNOM transmitter site. “I would also like to extend a special thanks to the evening broadcasters for their music choices and occasional voices at 2 and 3 in the morning. It is cold and getting dark at those times and it is comforting to hear the occasional voice on the radio, and the news broadcasts to keep me awake. I really appreciate the efforts made by the amazing KNOM staff. OUT OF SPACE, BUT NOT OUT OF PRAYERS: You, everyone you love and all of your intentions are in our prayers every day. Thank you especially for your prayers for us and the remote people whom we serve 24 hours a day. May Our Heavenly Father bless you abundantly for your generosity!